A new University of Washington study that tested 65 wines from America’s top four wine-producing states — California, Washington, New York and Oregon — found all but one have arsenic levels that exceed what’s allowed in drinking water. The two studies from UW electrical engineering professor Denise Wilson appear on the cover of the October issue of the Journal of Environmental Health. “Unless you are a heavy drinker consuming wine with really high concentrations of arsenic, of which there are only a few, there’s little health threat if that’s the only source of arsenic in your diet,” said Wilson. (Click to enlarge.) All but one of the tested wines exceeded the 10 parts per billion EPA drinking water standard for arsenic, and some New York wines exceeded the 15 parts per billion drinking water standard for lead.Posted with permission from the Journal of Environmental Health, a publication of the National Environmental Health Association, www.neha.org. Wilson also tested for lead, which is a common co-contaminant. 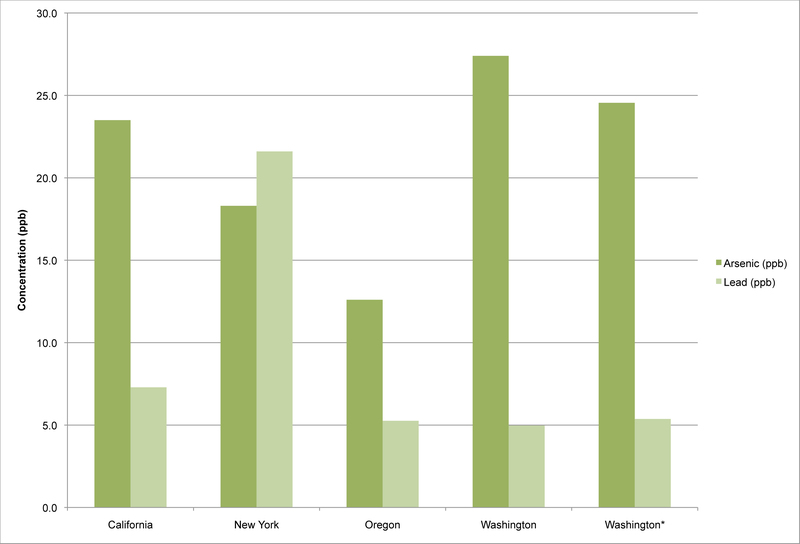 The study found lead in 58 percent of the samples, but only 5 percent — all from New York — exceeded drinking water standards. Where possible, the study also compared wines grown in “new” vineyards and those that had been converted from other agricultural uses like orchards, where farmers likely used arsenic-based pesticides that were popular in the early 20th century. 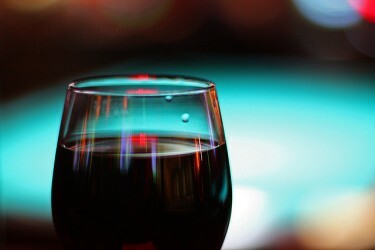 It found some evidence that higher levels of arsenic in Washington red wines could be a result of pesticide residue. Because the average adult drinks far more water (between 1.7 and 3.2 cups per day) than even core or frequent wine drinkers (roughly a half cup per day on average), it’s an imperfect comparison to gauge health risks based on the EPA drinking water standard of 10 parts per billion. That’s why Wilson also evaluated how much arsenic individuals can safely consume from all the sources in their diet. In a companion study, she compiled consumption data for foods that have been shown to contain arsenic — juice, milk, bottled water, wine, cereal bars, infant formula, rice, salmon and tuna. 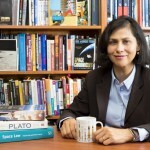 From that, she was able to determine how much of an arsenic “dose” an average child or adult would get from each food source and how close it would come to risk thresholds set by the U.S. Agency for Toxic Substances and Disease Registry for total arsenic consumption across a person’s diet. (Click to enlarge.) This chart estimates how close minimal, average and heavy consumers of certain foods would come to exceeding maximum recommended arsenic intake levels across their diets. 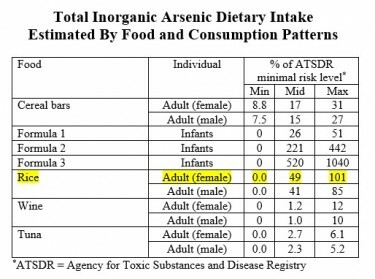 As highlighted, a woman who eats an average amount of rice would get 49 percent of the maximum recommended arsenic “dose” from that one source.Posted with permission from the Journal of Environmental Health, a publication of the National Environmental Health Association, www.neha.org. For the core or frequent adult wine drinker, the arsenic consumed from that single source would only make up 10 to 12 percent of the total maximum recommended daily arsenic intake. But if that person also eats large quantities of contaminated rice, tuna or energy bars, for instance, that could push that individual’s arsenic consumption beyond levels that are considered safe. A person who eats an average or large amount of contaminated rice would get between 41 and 101 percent of the maximum recommended daily dose of arsenic from that one source alone, the study found. A child who drinks apple juice could get a quarter of the maximum daily arsenic dose from that single source. 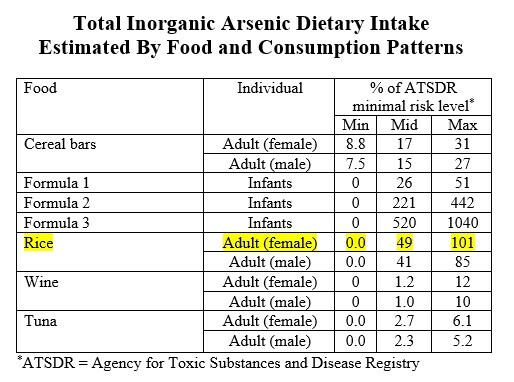 The food that posed the largest risk of arsenic poisoning was infant formula made with organic brown rice syrup, an alternative to high-fructose corn syrup. Wilson estimated that some infants eating large amounts of certain formulas may be getting more than 10 times the daily maximum dose of arsenic. Based on recent studies that have found arsenic in numerous foods and beverages, Wilson recommends that U.S. wineries test for arsenic and lead in irrigation and processing water and take steps to remove those contaminants if levels are found to be high. But rather than litigate against vineyards – as some have done – she would encourage consumers to evaluate their diets more holistically and speak with a doctor if they have concerns. Tests are available that can detect high arsenic levels and tend to capture arsenic exposure over longer histories than other toxic chemicals. 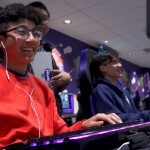 For more information, contact Wilson at denisew@uw.edu or 360-969-5959.